A new spin on the classic chocolate molten cake. 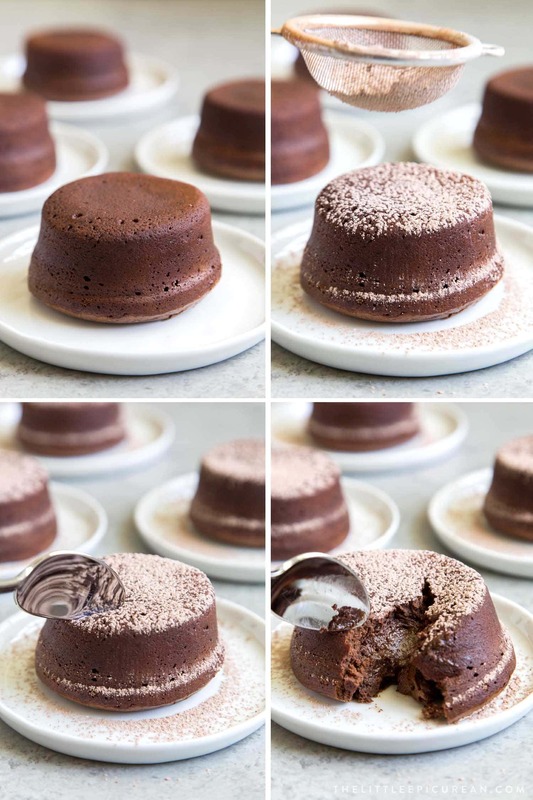 This 4 Ingredient Lava Cake is a shortcut method to achieve similar rich chocolate results with minimal effort! Thanks to the Donna Hay cookbook I was gifted for Christmas, I learned about this technique. As if sweetened condensed milk wasn’t already one of my favorite ingredients (great for making Vietnamese ice coffee, no churn ice cream, and sweetening anything and everything), turns out it’s also great for lava cake! Her cookbook features a quick and easy dulce de leche molten cake that uses canned dulce de leche as a sweetener and thickener. Canned dulce de leche is simply cooked sweetened condensed milk. My brain starting ticking and I immediately set to make a chocolate lava cake version. 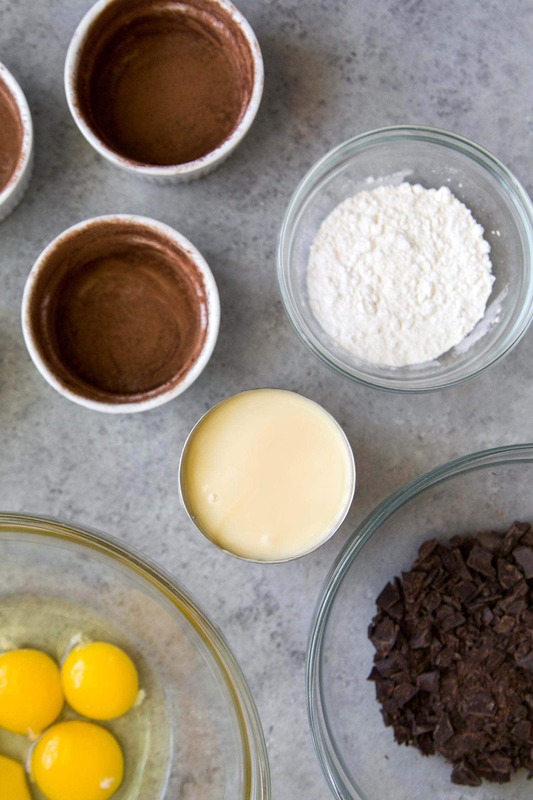 The four ingredients need for this chocolate molten cake are: unsweetened chocolate, eggs (and egg yolks), sweetened condensed milk, and all-purpose flour. 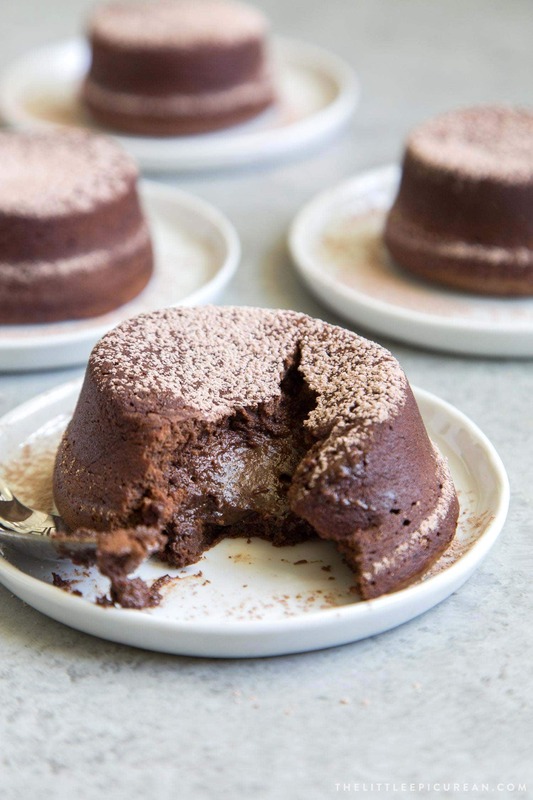 The chocolate lava cakes are baked in oven-safe ramekins. It’s the same vessel used for creme brûlée and baked egg dishes. Grease the ramekins with butter or non-stick spray. 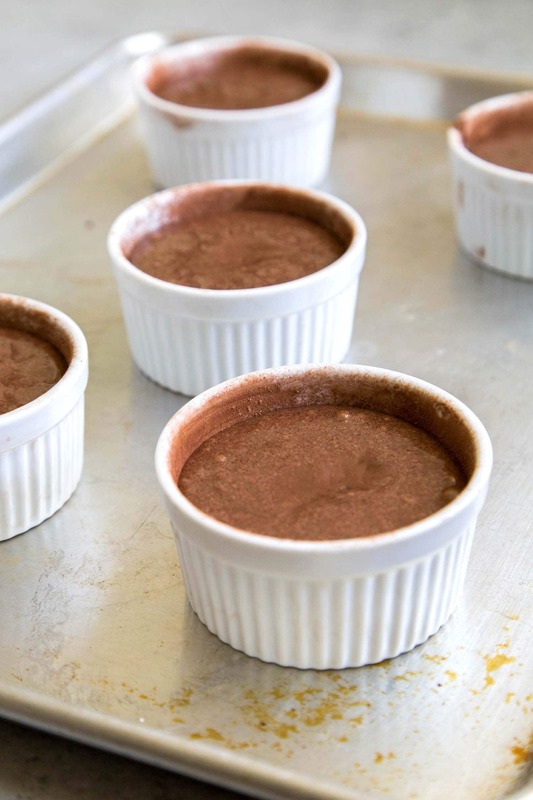 Dust the insides of the ramekins with sifted cocoa powder or all-purpose flour for easy cake removal. What is sweetened condensed milk? It’s made with two ingredients: sugar and milk. Remember condensation and evaporation from elementary school science? In this fashion, the sugary milk mixture is “condensed” meaning it is cooked to remove the water. The resulting mixture is rich, velvety, and creamy. Unsweetened chocolate is known by many names: baking chocolate, bitter chocolate, or cooking chocolate. Sold in bar form, it is basically 100% pure chocolate without any added sugar. First off, do not confused cocoa powder with hot cocoa mix. They’re not the same! Unsweetened cocoa powder is ground cocoa beans minute the cocoa butter (fat). In a pinch, one ounce of unsweetened chocolate is equal to three tablespoons cocoa powder mixed with one tablespoon of neutral flavored oil. The recipe begins by melting chopped unsweetened chocolate. This can be done over a double boiler (bain-marie) or at half power intervals in the microwave. While the melted chocolate cools, beat the eggs and egg yolks until smooth. Mix in can of sweetened condensed milk. Stir in melted chocolate. Last step, fold in the flour. Distribute the batter among prepared ramekins and bake. In less than 15 minutes, you’ll be enjoying warm, fresh from the oven, ooey gooey chocolate lava cake. 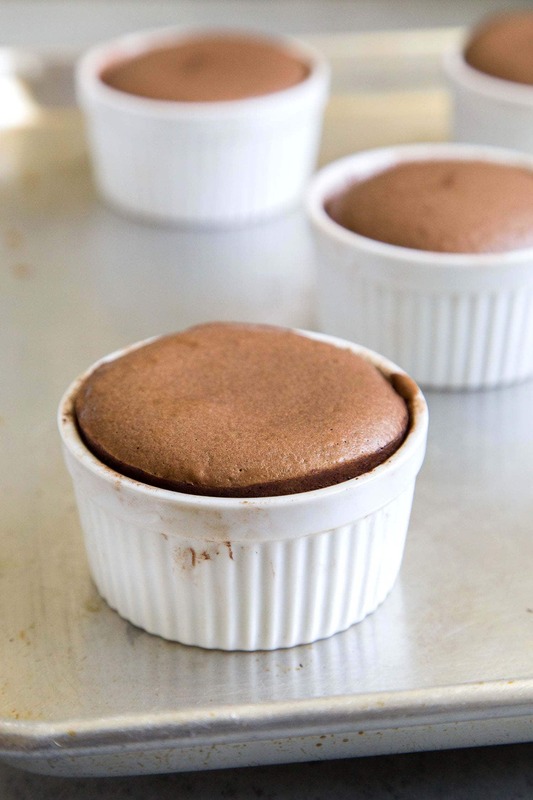 Allow the ramekins to cool for a minute before inverting the lava cakes onto a serving plate. JUST ONE MINUTE. Any longer and the cake will continue to cook. The lava cakes need to be eaten immediately because if you let the cake sit, the insides will continue to cook and stiffen…meaning no more gooey insides. This 4 ingredient lava cake is plenty sweet on its own. I opted to simply dust it with a mixture of unsweetened cocoa powder and confectioners’ sugar. For a more decadent approach, top the warm cakes with whipped cream or ice cream! Preheat oven to 400 degrees F. Generously grease five 6 ounce ramekins with butter or nonstick spray. Dust with sifted unsweetened cocoa powder. Tap out excess cocoa powder. Place ramekins on baking sheet and set aside. Gently melt unsweetened chocolate over a bain-marie* or microwave at half-power at 20 second intervals until smooth. Stir oven to ensure even melting. Set aside and allow to cool slightly. In a large bowl, use an electric hand mixer to beat egg and egg yolks until pale in color, about 2 minutes. Add in sweetened condensed milk. Beat until well combined. Add in melted chocolate and stir to incorporate. Sift in flour and fold to combine until there are no longer any dry streaks of flour. Divide batter among the prepared ramekin cups. Bake for 10-12 minutes until the edges are set, but the center of cakes are still soft. Let baked cakes stand in ramekin for 1 minute. Gently run a butter knife or mini spatula around the edges of the ramekin. Invert ramekin onto serving plate. Serve immediately. Garnish with confectioners' sugar, cocoa powder, or whipped cream. To set up a bain-marie: fill a pot with 1-inch of water and bring to a simmer. Set mixing bowl over pot. Select a mixing bowl large enough that when placed on top of pot, the mixing bowl does not touch the water. Unsweetened chocolate is sold in bar forms. It is also labeled as baking chocolate, bitter chocolate, or cooking chocolate. 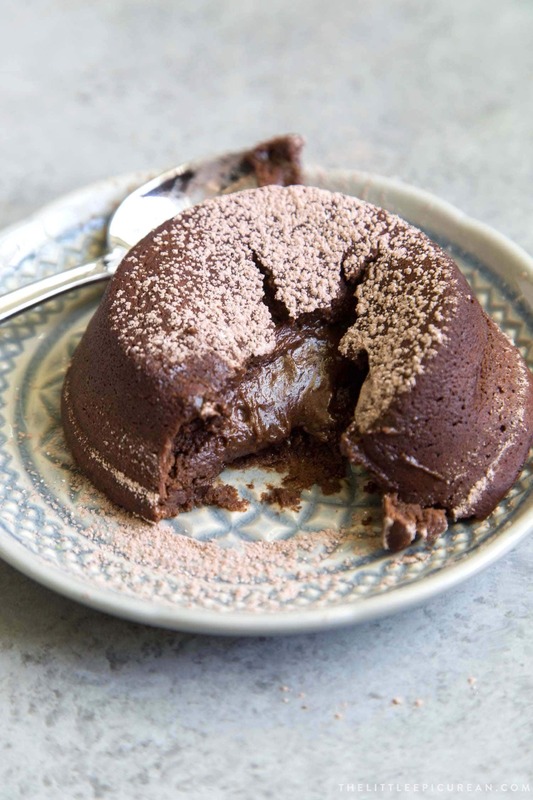 These lava cakes can also be baked in standard muffins tins. Grease muffin tins as directed and reduce baking time to 7-8 minutes.